In Nogales we trust. I would NEVER have put mayo and beans on a hot dog, but it was delicious!!! This place was a cart in a parking lot, but we drove 45 minutes to get there. Even all the little ones with us had a good time. The only let down was no diet beverage options we're available. We will be back again. First off, Nogales Hot Dogs isn't really a restaurant, just a food truck and tent with tables. They set up every night around dusk and pack up at 2am. 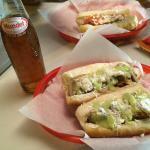 The menu consists of Sonoran-style hot dogs, chips and bottled Mexican soft drinks. Although one can find Sonora dogs all over the valley, Nogales Hot Dogs enjoys a deserved reputation as one of the standouts. If you've never experienced a Sonoran hot dog, let me explain... Like its northern cousin from Chicago, the Sonoran version is a localized embellishment of the lowly ballpark weenie on a bun. This uniquely borderland presentation consists of a bacon-wrapped hot dog, a smear of mayo, some pinto beans, diced tomato & onion, and a sprinkling of cotija cheese. (Cotija is a crumbly salty somewhat pungent skim milk cheese, sort of a Mexican grated Parmesan) Each dog is assembled upon order so you may omit any item as desired. If you really want to load up your hot dog, there's also a condiment bar with chiles, mushrooms, several salsas, cilantro, and more cheese. Personally I'm partial to the mushrooms and salsa verde... Sodas are of the bottled Mexican variety (including Coca Cola products) which, as they originate from Mexico, are all made with cane sugar rather than high fructose corn syrup as are American sodas. Soda aficionados are apparently picky about such things and insist on the superiority of the "real sugar" versions. Patrons are welcome to dine "al fresco" at the tables (trust me, it only SOUNDS fancy) or take their order to go. Service is efficient but friendly, and they accept both cash and all major cards. If you overspent at the bar but need to satisfy those late-night munchies, or you can't stand the thought of another visit to Denny's, or you just want to try a tasty twist on the humble hot dog, give this place a try.